A brand new generation of super-fast USB has just been finalised, and it's going to save you many precious seconds in jamming things the wrong way round. 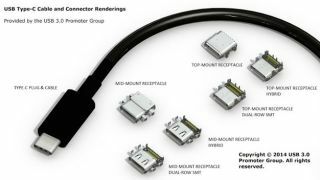 The USB Type-C can be plugged into a port either way round (just like Apple's Lightning connector), and is designed to work with phones, tablets and laptops. The new variant of the 10Gbps USB 3.1 standard is about the size of a micro-USB connector, and around twice as fast as USB 3.0. Basically, it's all good news. The only annoyance is that the new USB won't be compatible with the current USB standard unless you're using a converter. But you should be fine for the time being, as we await the slow transition. Just think of all the seconds you'll accumulatively save from this. Maybe you could use them to learn the jazz flute? Is USB finally going to kill the desktop?